Big Ron had a stellar career behind the microphones of some of the most legendary stations in radio history. 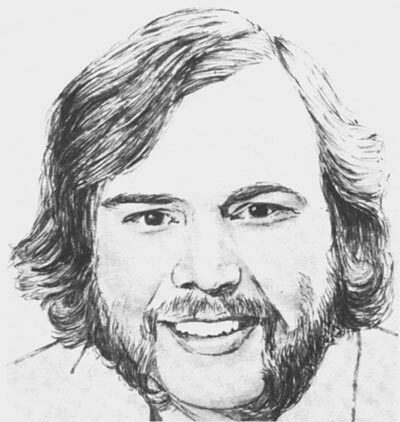 Prior to arriving for at WPGC in 1976, he worked at blowtorches such as KUDL / Kansas City, KTLK / Denver, WQXI / Atlanta and WCFL / Chicago. Ron's illustrious tenure at WPGC continued through the Great Strike That Struck Out in May, 1977. His string of gigs at industry defining stations later included WFIL / Philadelphia, WRKO / Boston, KFI / Los Angeles, 99X / New York, WOKY / Minneapolis, 66 WNBC / New York, KIIS-FM / Los Angeles, KWK / St. Louis, KZDG / Denver, KKBH / San Diego and Star 104.5 / Philadelphia. On October 8, 2001 he joined CBS' WOGL / Philadelphia for afternoon drive, his final on air position. Ron was nothing less than an immensely talented man whose demeanor was genuine, sincere and full of love. Read more. If you would like to share your memories of him for inclusion on this site, please email the webmaster. I can remember driving all over the Washington area just to find the strongest signal possible to listen to Big Ron on WCFL booming in at night from Chicago, demonstrating the proper way to talk over their famous top of the hour jingle. Then a couple years later I had the pleasure of watching Big Ron in action every night on WPGC. I was the phone handler as well as weekend and fill in DJ. I did everything I could just to be in the studio to watch him and learn. I think what made him so good was his attitude towards the show, and his tremendous love for being on the air. When he cracked the mic with cigarette in hand, he lit up like a 300 pound Christmas tree. His smile and laughter poured through the speakers like no other I've ever witnessed. He was a fun lovin' partying kinda guy who called me 'Martian Marty'. I first met Big Ron when he came to WPGC to do 6-10pm in 1976. It bumped me from 10pm-2am into overnights, but I didn't care. Big Ron was the best top 40 night man in the country and we had him. He was amazing, and WPGC improved to an Arbitron 10 share with Ron driving nights. Tim Kelly who was doing mornings at the time was Big Ron's best friend. The two of them worked together several times. He once told me Ron didn't own a t-shirt without a pizza stain on it. He also told me Ron was the best top 40 DJ he'd ever heard, and he was right. Many years later Ron and I ran into each other again when he was voice tracking afternoons on WJMO (formerly WGAY and now Hot 99.5). We talked a few times by phone on days when he was cutting his tracks late. He'd just send the audio and I'd record it here in DC, then mix it with the song later. It was amazing. He would talk up a song, seemingly stop, then start after a pause. Of course no song was playing, he just heard it in his head. Later when we'd put music to it, the pause would fit perfectly as the singer threw in an 'oh yeah' or some such. He just knew the music. He was simply put, 'The Best'. 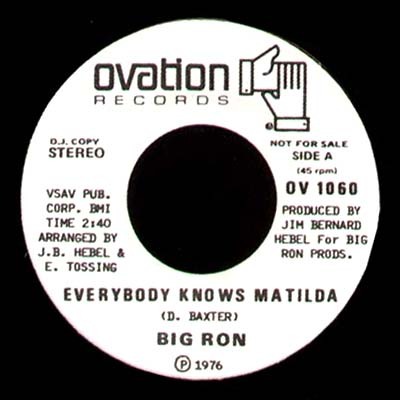 Big Ron was an inspiration to disc jockeys all over the country. We all listened to the energy and excitement that he was able to bring to the radio. He will be missed by many fans. An air personality like Ron cant be replaced. It is a loss not to be able to hear him on the radio any longer. I remember Big Ron's love for big, funky record intros  he would work that mike like no other. He could play the same song 100 times, and never intro it the same way. He was a true top jock  a real pleasure to work with. I'll miss him. I recently learned of the passing of Big Ron O'Brien and can honestly say not only did it floor me but it also broke my heart. I first started listening to Big Ron in 1972 when he was at WCFL in Chicago and can remember saying to myself... "Who is this guy? He is unbelievably good." I used to sit around at night and record his "breaks" on the air then play them back over and over and over. Little did I know it at the time but he inspired me so much that the next year, I, too, was in radio as an on-air DJ. A couple of times, I phoned Big Ron in Chicago and he was very gracious taking time out to talk to me, answering any questions I had and he even invited me down for a tour of WCFL. Later that summer, a "radio buddy" and myself took Big Ron up on the offer and drove down to the windy city to meet him. He showed us around the "Super CFL" studios, let us sit in on his show, (Big Ron "in action" now THAT was a sight to see) he gave us some station memorabilia, invited us over for pizza & beer after the show and even offered us a place to crash for the night. Needless to say, we were totally blown away by his warmth, grace and all-out friendliness. When the "competition" came up in the conversation, he didn't bash them but rather talked about the strengths of his station and co-workers. That was Big Ron, he wouldn't hurt a fly, not even those who were out to beat him in the ratings. So that was in 1973 and last year (2007) I tracked Big Ron down in Philadelphia and reminded him of my trip down to Chicago and he wrote back saying... "Sure I remember you guys. You were from Canada and we partied it up that night, didn't we?" We sure did. Like I told John Rook, Big Ron's program director at WCFL, I've listened to a lot of radio over the years and in my opinion, not only was Big Ron O'Brien really, really, really good on the air - he was much more than that, he was simply the best, period. He had no peers and possesed this "sense" of how to "intro" songs, "hit posts" and do "killer" breaks. He also had a one-of-a-kind energetic and powerful voice plus how about that infectious laugh of his? You just could not help absolutely loving this guy on the air and if Philadelphia was lucky enough to be able to tune him in every day then you are blessed in more ways than you know. In closing, they say that once radio waves leave the transmitter, they go forever into outer space and I can't help but seeing some alien in a far away galaxy tuning in a radio and thinking to themselves..."Well who do we have here?" 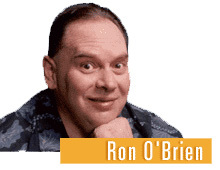 You have Big Ron O'Brien, the best "boogie, boss jock" in the history of planet Earth radio - that's who. Sleep well good buddy. (Special thanks to Matt Seinberg at BigAppleAirchecks.com for the above). prior to arrivng at WPGC in 1976. Click label to hear it! Big Ron on the air at KFI / LA , KIIS / LA & KKBH / San Diego.